It could be a lot worse. It WAS a lot worse in the early 1980s. Isn't the Prime Rate a function of Federal Reserve policy, with the banks accordingly setting the Mortgage Rates? 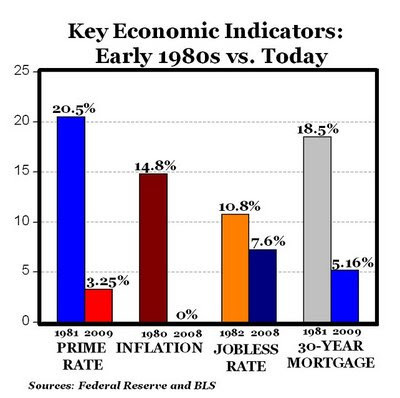 The difference in these numbers (1980 vs. today) only reflects the Fed's monetary policy (manipulation vs. free market) and doesn't tell us how difficult our times are (it probably tells us how difficult times are for the Federal Reserve). Also, isn't it true that criteria for gathering jobless rates has been modified? For example, when someone exhausts their unemployment insurance, they're no longer counted even though they aren't employed. How can you count the unemployed unless they sign up for insurance or employers divulge their payroll stats? Furthermore, how can anyone determine, accurately, the rate of inflation when the government has stopped showing the M3 money supply stats? I enjoy looking at your blog as I'm more interested in the economic aspects of the nursery industry. This is an area that needs more study, in my opinion.